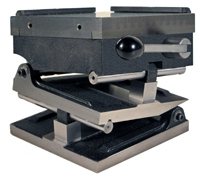 Taft-Peirce SINE ANGLE PLATES & SINE ANGLE CHUCKS by Suburban Tool, Inc.
Made from close-grained, heat treated cast iron. Sine rolls made from tool steel, hardened and lapped. 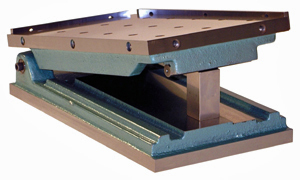 Sine angle plate top plates are equipped with end stops for positioning work, and tapped holes for use in applying clamps. 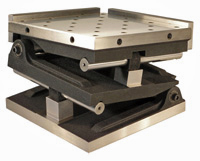 Sine angle magnetic chucks combine the principle of sine angle plate construction, utilizing a permanent magnetic chuck. 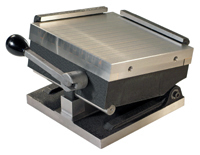 Sine angle magnetic chucks are available in either simple or compound angle styles. 9229 Compound 12" 6-1/2" 4-3/4" 5/16-18 5" ±0.0002" & 10"